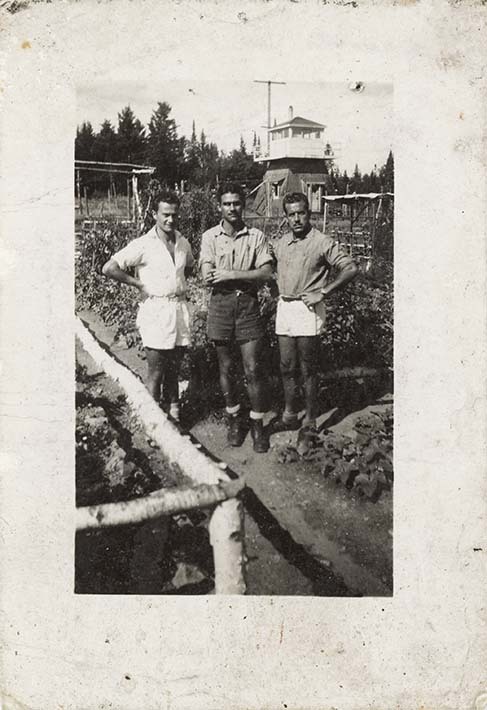 Three internees standing in the camp vegetable garden. Camp guard tower is visible in upper right background. Given the informal setting, it is unlikely the picture was officially authorized. This image was likely taken at the same time as DICEA2011.0001.0012, DICEA2011.0001.0013, DICEA2011.0001.0028, DICEA2011.0001.0029 and DICEA2011.0001.0031. Man in the middle is Osvaldo Giacomelli.